A daily schedule/visual schedule is one of my go- to recommendations that I love to introduce to the families I work with. It can be such a helpful behavioral tool for managing problem behavior, teaching skills, helping to increase independence, promoting self-management behavior, and opening up Mom & Dad's time throughout the day to do other things besides keep their kids busy. Cause you know....other things actually need to get done in a typical day. 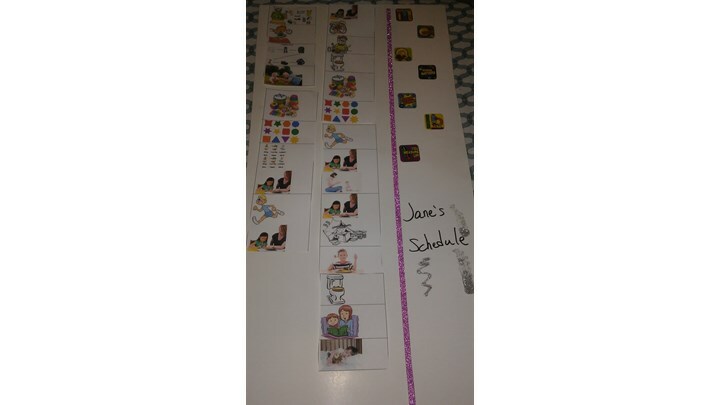 Making your own visual schedule for your household does not have to be confusing or overwhelming. I help clients make these all the time, and I use them in my home with my own munchkin. Again, believe me when I say: this strategy does NOT have to be confusing! Learn how to create a visual schedule appropriate for a young child or an older child/teen, what materials to use (no, you don't have to download an app or order something off a site), and some secret hacks to moving your child from hyperactivity, attention-seeking, or defiant behaviors throughout their day, to calmly transitioning from one appropriate activity to the next.